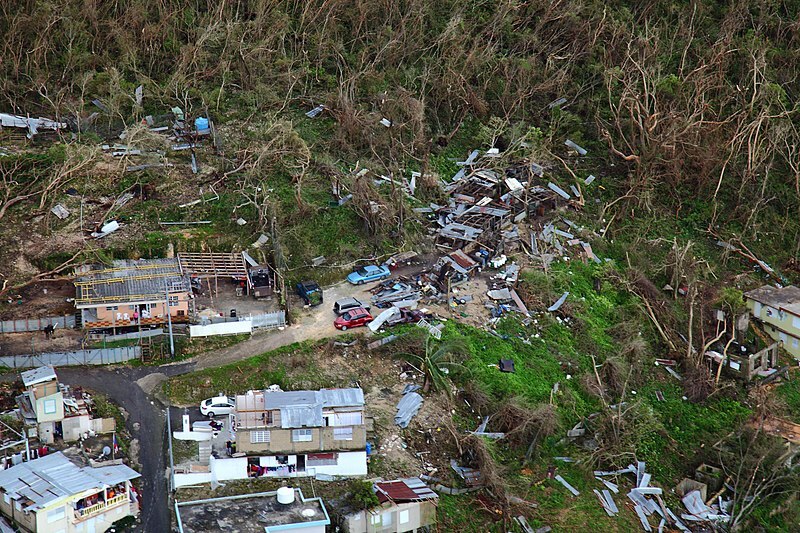 Now that the zombie healthcare bill has been defeated again (for now), please turn your attention to Puerto Rico which is in terrible shape after getting clipped by Hurricane Irma which left tens of thousands without power and then being hit head on by Hurricane Maria which pretty much destroyed what was left. Despite Trump's claim that "we're doing a really good job" on Puerto Rico's recovery, sane people report that the response has been slow, inadequate and confused. The island is largely without fresh water, fuel, cell service, and power. All crops have been destroyed. Flooding was intense. Many structures are either damaged or destroyed. Few hospitals are operational. And it is likely to take many months to restore basic services to the majority of inhabitants. In other words, it's Hell. Here's Vox's summary of the situation. One of the underlying problems is the Jones Act - an archaic law that prohibits the delivery of fuel and other goods by anything other than flagged US ships and that has been strangling Puerto Rico's economy for a long time by forcing the island's inhabitants to pay roughly twice as much for US goods as people on the mainland. If you'd like to read more about the Jones Act, check out this NYTimes opinion piece, this article in The Hill, or this USA Today article about it. Please call your members of Congress today to ask them to help. Script is below. 1. Find your Senators' numbers here and your Representative's number here - keep in mind that you may have to try more than one office to get through. 2. When you get through, say, "Hi, my name is ____ and I'm a constituent calling from _____to urge Senator/Representative_____ to speed Puerto Rico's recovery efforts by waiving the outdated Jones Act that is slowing down relief efforts - this is something DHS has done previously in the wake of natural disasters and we should do it again. I also urge him/her to fasttrack a special aid and relief package to help the island recover and rebuild. Puerto Rico is entitled to the same aid as any other US state but they're not being treated equally. The island was already teetering on the brink of economic disaster before these two natural disasters and they need all the help they can get. Thank you for taking the time to take my call."